The Schneider Compact ND Kit for 114mm Diameter Lenses comes with 3 round 4.5" drop-in filters with a holder that will attach these filters onto 114 front diameter lenses that don't have front filter threads. 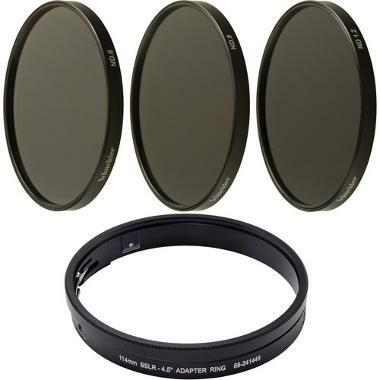 This kit is a streamlined solution for when using traditional matte box filters is not possible. With these filters you can darken your entire scene in order to use a wider aperture or slower shutter speed for creative purposes. They are made from high quality Schott glass with brass rings. These are ideal for filmmakers and other fine art purposes. • We will be monitoring each filter for scratches and nicks and you will be held responsible for any damage due to misuse or abuse of the equipment.